As a kingdom surrounded by the sea and permeated by an extensive network of waterways boating has always been at the heart of British culture and so its many marine events play a key role in its annual social calendar, providing perfect days out for the whole family. At the beginning of August yachtsmen and women and yacht lovers from across the world descend on the Isle of Wight’s premier sailing town Cowes for a week of competitive sailing and exhaustive partying. Cowes Week is the longest-running regular regatta in the world, having started in 1826. The races are held on the Solent, the stretch of water between the Isle of Wight and southern England. The grand sailing event typically features over a thousand boats and around 8500 competitors in addition to over 50,000 sailing fans and revellers. As well as the sailing activities, the programme features a lively calendar of onshore activities including live music and cocktail parties and is particularly noted for its firework demonstration on the final Friday night, where the rockets are launched from barges on the Solent. Organisers National Boat Shows run two highly successful and long running annual boat shows – Southampton Boat Show and the London Boat Show. The London Boat Show has been running for well over fifty years now and has cemented a formidable position as the largest annual London event. The giant showcase for everything sea worthy now takes place at the waterside setting of the ExCeL Exhibition Centre in the redeveloped Docklands area of the city. The prestigious show features such popular attractions as classic boats, a watersports area, anchor watch, a Navy war ship and exhibits famous boats such as in 2007, when Ellen MacArthur’s Extreme 40 make a celebrated appearance. The Southampton Boat Show takes place every September and has remained a popular event in the boating calendar for forty years. Visitors can expect such attractions as the 2.5 km of the show’s famous Hydropool Marina and Try-A-Boat, which offers anyone the chance to get out on the waters and enjoy the joys of boating. There is always a special guest appearance, such as 2007’s HMS Bounty, which is renowned for its starring role in the films Mutiny on the Bounty and the third Pirates of the Caribbean film. The inland waterways of the UK receive their premier annual celebration in the form of the Crick Boat Show. The event is built around the picturesque Crick Marina, itself nestled in the rolling countryside of Northamptonshire. British Waterways and Richard Event Management have made the event a favourite amongst boat-loving families with its mix of free boat trips, exciting demonstrations, live music and a gold mine of exhibitions. The Henley Royal Regatta is a prestigious rowing event held annually on the River Thames by the Oxfordshire town of Henley-on-Thames. The regatta was first held in 1839 and has been held every year apart from during the two world wars. The event lasts for five days over the first weekend in July and comprises of head-to-head knock out competitions raced over a course of one mile. Henley Regatta is a massive spectator affair and an important marquee event on the English social calendar along with Wimbledon and Royal Ascot. Cowes also holds the four day Cowes Powerboat Festival at the end of August which attracts race teams from all over the world to compete in its eleven races. 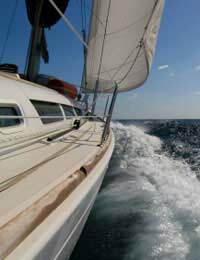 The Royal Yachting Association (RYA) and Waterways.com both provide extensive online information on sailing and boating events. British marine events provide entertainment for everyone, whether they want to get involved in the boating events or just want to watch from the shore and schmooze with fellow boating fans.